As soon as I had the pleasure of meeting this colorful, spirited, ultra-pink sensation, her infectious pink accessories and zebra prints won me over instantly! Since then, she's managed to win over audiences all around, singing and performing her music in bands, acoustic shows and even a few full length albums! Settling down in Los Angeles, she now spends her time in writing meetings, recording sessions and collaborative licensing projects. With all the people to meet and places to be, what's a girl to wear without wearing out her wallet?? In her line of business, no one likes to see repeats. As a singer/songwriter/business woman in the music industry, a consistently fresh and signature style is key in separating herself. And since Krysta is not normally one to bum around in jeans and a tee, this industry requirement fits her perfectly! I was more than happy to shine a new light on her crazy wardrobe. The objective for Krysta was to find some cohesive, modern and feminine outfits for her to run around town in all day. But before going straight to the shopping, I took a look inside her closet to make sure it was being fully utilized. And surprise, surprise - it wasn't! After going through her amazing closet, I picked out some wonderful pieces she never before looked twice at. Then we went out to fill the gaps in her wardrobe and make her some complete outfits. I picked out a pair of simple plum, leather heels to play with the various purple and blue florals in her bolero. The heels will also go with her leggings, denim and other skirts she has in her closet. I saw so many options with the bolero. I added it to a more casual, eclectic ensemble - once again, the top and skirt she already owned. I picked out the necessary accessories and another pair of heels! The bird pendant, I styled more as a rosary instead of a necklace. The stone and design was just so flippin cool, and added a real je ne sais quoi to the overall look. Just so you know, I never use that saying but for this - for this, it worked! The glasses? Totally signature Krysta style and a must! 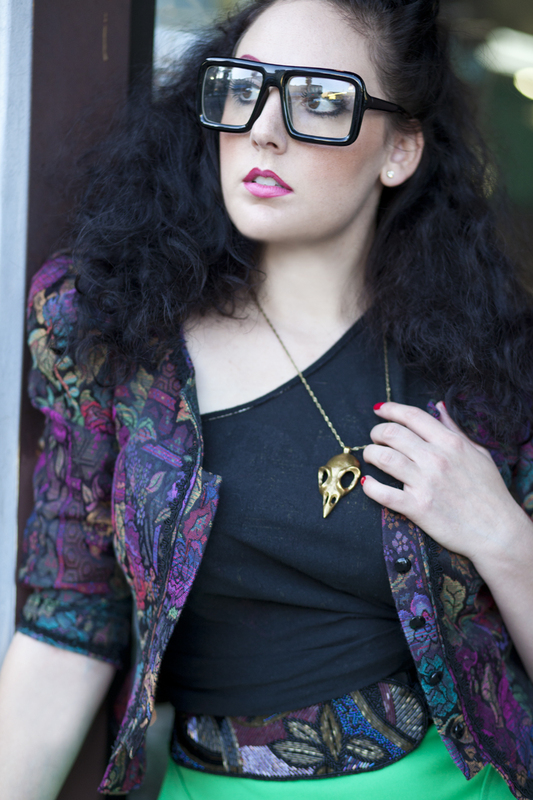 The bird skull necklace was edgy and a great juxtaposition to the floral brocade. We even found a beaded belt to put her jersey over-the-shoulder tee and retro skirt. Krysta loved these snake print platforms and their retro design went beautifully with the midi skirt. Very femme - and groovy without being dated. Again, these heels will go with everything she owns. The last outfit, was out of left field. Out of her closet, I found an elegant icey brocade coat with crystal buttons. Such a charming coat! So I totally vamped it up with a leopard dress and leopard sandals. 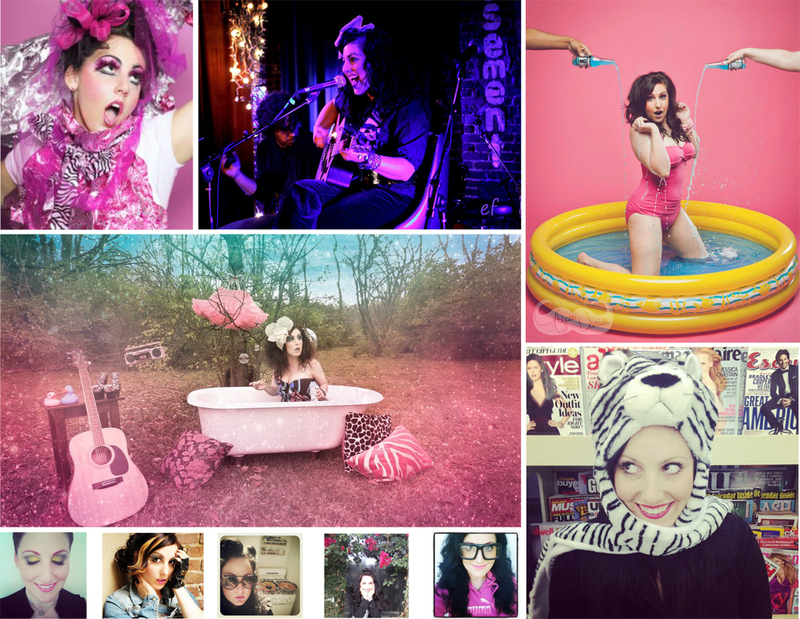 I love mixing patterns and genres but what was most important was, Krysta loved it. We even found some vogue-like sunnies to compliment the mixture. A look to wear out for drinks, movies or a show, this is definitely a riskier evening outfit. But I couldn't think of any other girl whose personal style could, and would, pull it off. The sandals had a great resort look to them and I especially liked the flawless gold hardware! I tied them once in the back (instead of lacing them up the ankle) to give them a more romantic, sultry feel. While we went through Buffalo Exchange, I got some detail shots of the store. 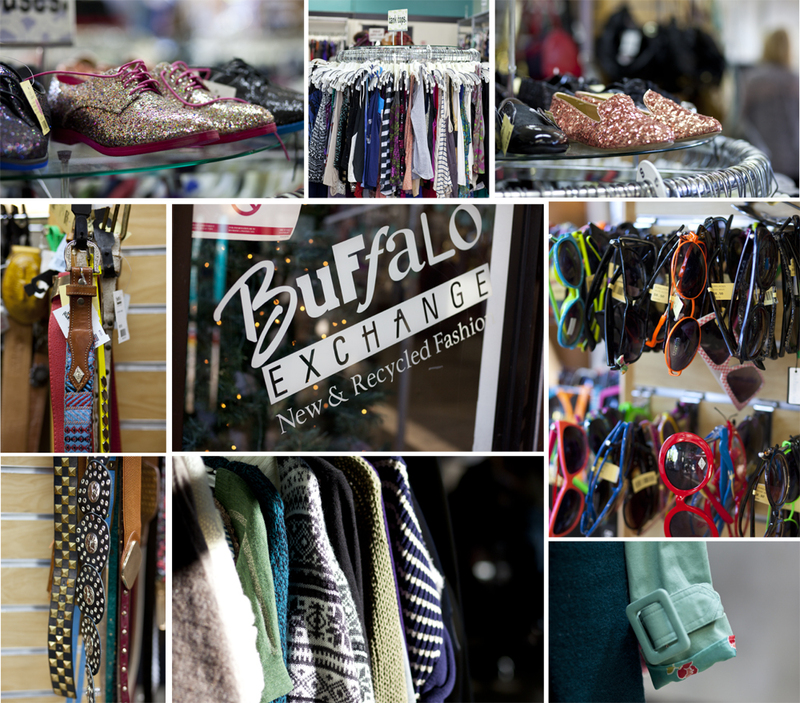 To clarify, I've always been aware of Buffalo Exchange's existence, even since the 90s but I never gave it much thought. Now I know why they've been a success for so long! While styling Krysta and really taking advantage of everything around us as viable wardrobe options, I was so impressed with the selection! And then shocked that I had missed out on such a gold mine all this time! It only seems obvious to me now to visit my own local BE in Seattle. After the first visit, I am now a FAN! Everyone was incredibly friendly (and super stylish) as we took our time walking though the store. I had to keep focus as I saw so many items for myself! But it actually says a lot, because Krysta and I definitely have contrasting tastes and we were both literally cooing all over the place. So if you're late to the party like me, check it out for yourself!! They're mainly all around the coast with a few in the Midwest, so if you're in these areas - go there as soon as you can! from my lil closet to yours! Amazing!! Wonderful style, I especially love the bolero and brocade coat assembles.